[CES 2012] Ecovacs Winbot Goes All Roomba On Your Windows | OhGizmo! Through a combination of good marketing and of actually being available in America, the Roomba vacuuming robots are well known. But they’re not the only cleaning bots on the block. Ecovacs has been making these for years, but at CES this year I stumbled onto something I hadn’t see before. It was a cleaning robot that cleaned windows. Vertically. It’s called the Ecovacs Winbot and it’s a robot that splits in two. Both halves are joined together by strong magnets, with your pane of glass sandwiched in between. The cleaning is done through a 3M cleaning cloth, so I’m not sure how much dirt or grime it can handle. But it does work as expected, making its way across a window until it’s clean. Of course there’s a bit of a problem in that you’ll probably need two people to get it going in the first place, one inside and the other outside, each holding one half. But if manual cleaning is something you really hate, there’s a robot for that now. The Winbot is currently available in China and Europe and a representative said it should come to America within a year. It’s $399. 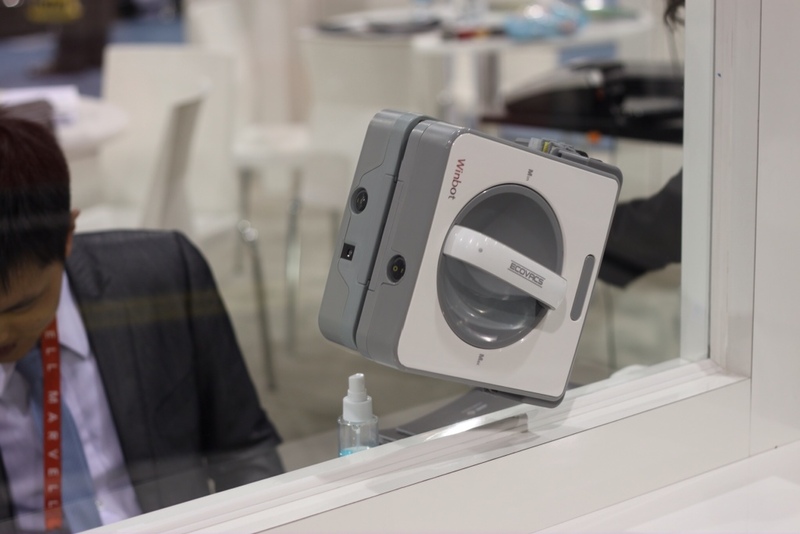 How fast can this robot clean windows? It would be good to have this clean windows that we cannot reach but if the time would get all day, I think it wouldn’t be much of a difference. I can see this being plausible for tall windows, however, for $399 I think I’ll get a ladder and some windex. I can’t ever imagine this being practical for anything else than large, tall or difficult to reach windows. … But I want one anyway. If it takes a a few hours, I don’t care, I can go do something else in the meantime!